New foraminiferal data from the Bahama region are used to investigate the mechanisms regulating subtropical climate. 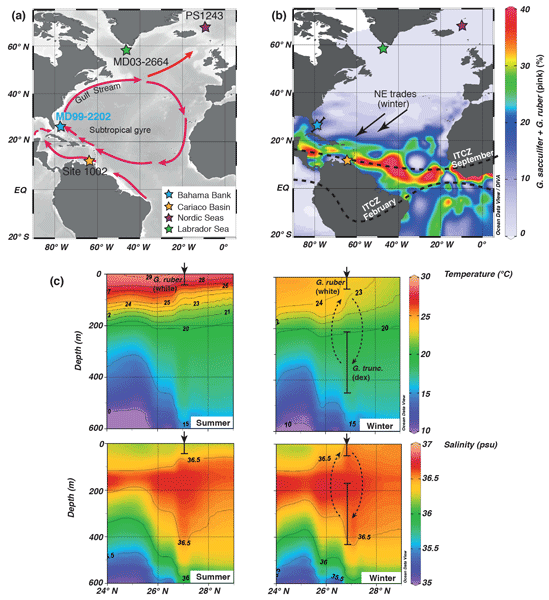 Our results suggest that the sensitivity of the low-latitude climate increased at times of enhanced sea-surface freshening in the subpolar North Atlantic. This has further implications for future climate development, given the ongoing melting of the Greenland ice sheet. 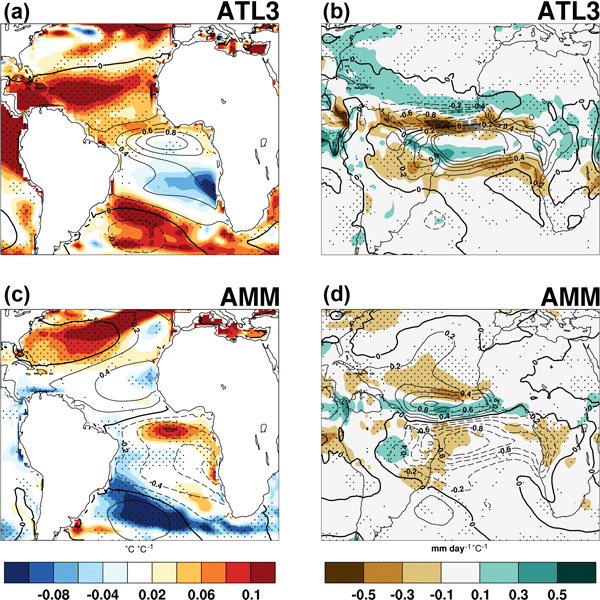 Year-to-year changes in rainfall over Africa and South America are influenced by variations in the temperatures of tropical Atlantic variability. Here we investigate how these variations behave under climate change using a series of multi-model experiments. We look at how cold and warm climates of the past relate to future shifts in variability. 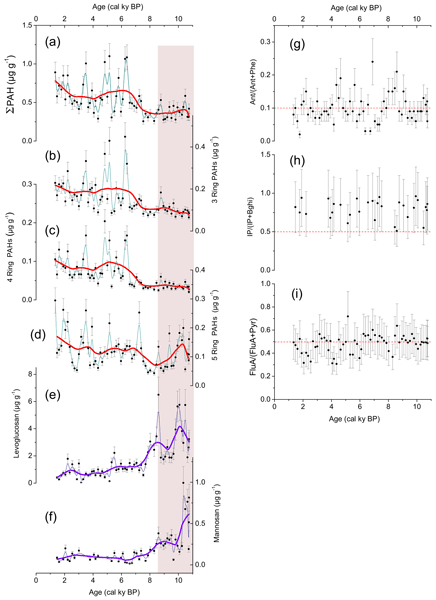 Climate equability is a paradox in paleoclimate research, but modeling suggests that strong seasonality should be a feature of greenhouse Earth periods too. 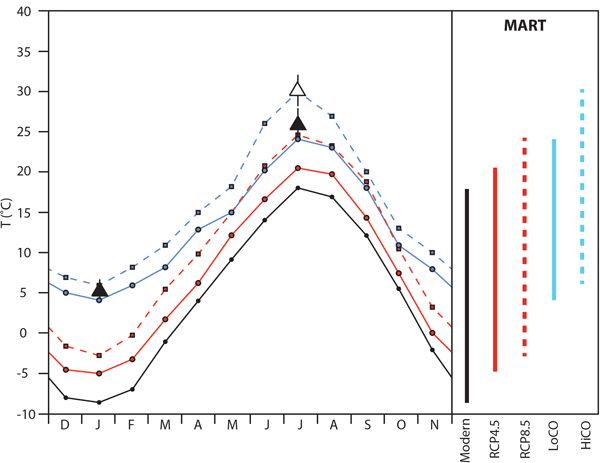 Records of temperature from floral assemblages, paleosol geochemistry, clumped isotope thermometry, and downscaled models during the early Eocene show that the mean annual range of temperature was high, and may have increased during warming events. This has implications for predicting future seasonal climate impacts in continental regions. During the last glacial–interglacial climate transition (120 000 to 10 000 years before present), Greenland climate and midlatitude North Atlantic climate and water cycle vary in phase over the succession of millennial events. 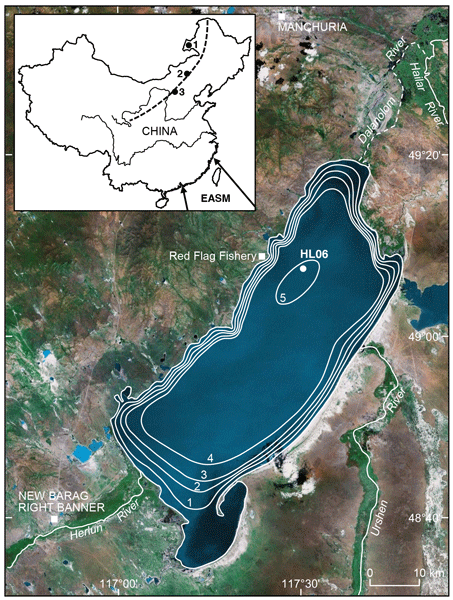 We identify here one notable exception to this behavior with a decoupling unambiguously identified through a combination of water isotopic tracers measured in a Greenland ice core. 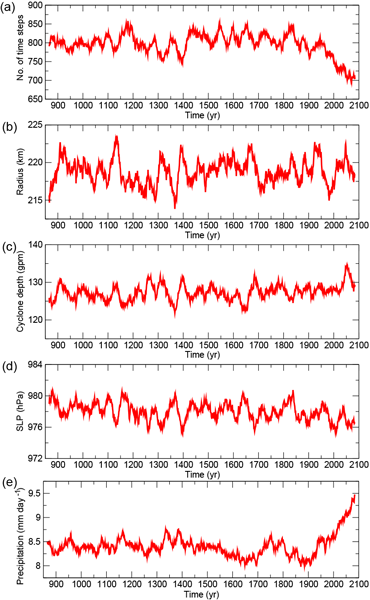 The midlatitude moisture source becomes warmer and wetter at 16 200 years before present. Verterbate fossils suggest tropical climates and environments for the middle Miocene of western Anatolia (mammal zone MN6). We used three palaeobotanical proxies and inferred warm temperate climates. 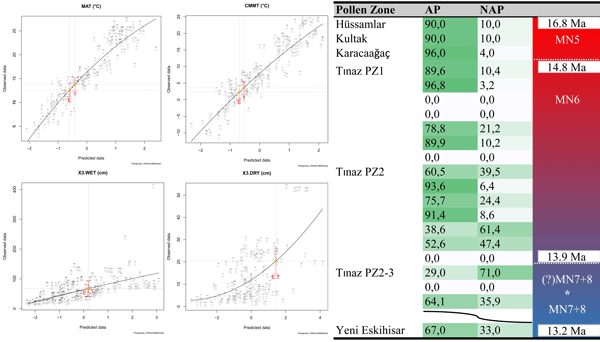 The onset of Miocene cooling (middle Miocene climate transition, MMCT, 14.7–13.9 Ma) is characterized by fluctuating ratios of woody and herbaceous pollen types, while a herb-rich pollen zone indicates pronounced cooling at 13.9–13.8 Ma. Prior to the MMCT (MN5), forest vegetation prevailed. We investigate the regional dynamics at the beginning of the last ice age, using a nested configuration of the Weather Research and Forecasting (WRF) model with a simple ice flow model. We find that ice sheet height causes a negative feedback on continued ice growth by interacting with the atmospheric circulation, causing warming on Baffin Island, and inhibiting the initiation of the last ice age. We conclude that processes at larger scales are needed to overcome the regional warming effect. The Greenland ice sheet is a huge frozen water reservoir which is crucial for predictions of sea level in a warming future climate. Therefore, computer models are needed to reliably simulate the melt of ice sheets. 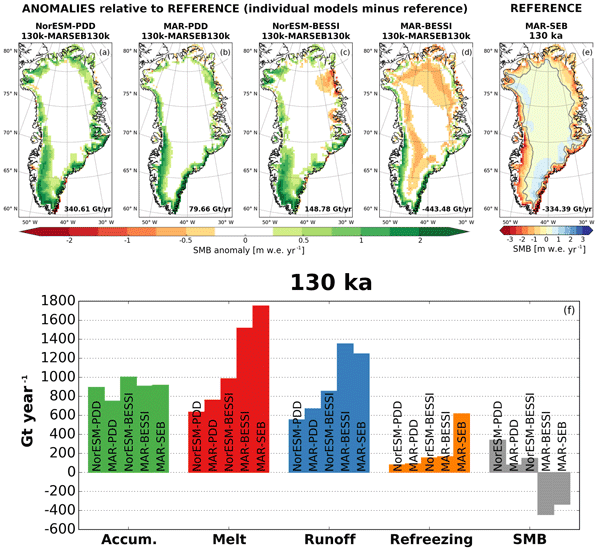 In this study, we use climate model simulations of the last period where it was warmer than today in Greenland. 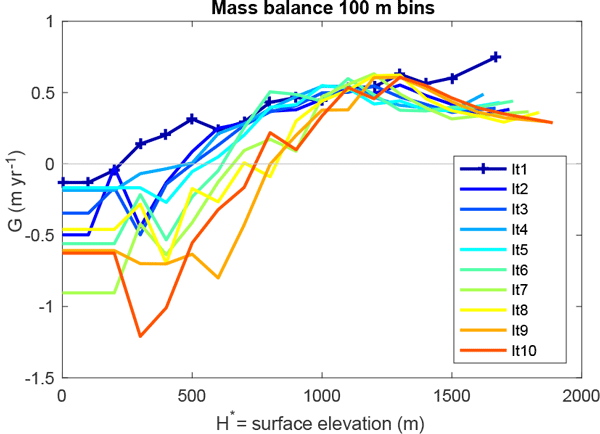 We test different melt models under these climatic conditions and show that the melt models show very different results under these warmer conditions. This paper reviews thousands of French historical documents. They show a record of extreme storms and sea floods. The results show periods of increasing and decreasing storm frequency over a long time. Furthermore, coastal hazards have forced societies to adapt and develop specific coping strategies. 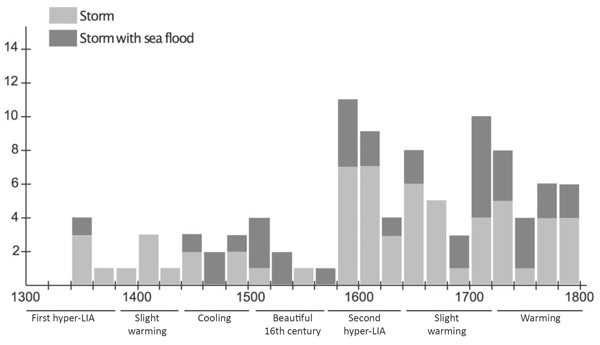 This paper analyses responses of past societies to these hazards. Thus, useful ideas may be (re)discovered by today’s societies to enable us to adapt and be resilient. Extratropical cyclones in winter and their characteristics are investigated in depth for the Atlantic European region from 850 to 2100 CE. During the Common Era, cyclone characteristics show pronounced variations mainly caused by internal variability of the coupled climate system. When anthropogenic forcing becomes dominant, a strong increase of extreme cyclone-related precipitation is found due to thermodynamics, though dynamical processes can play an important role during the last millennium. This study uses statistical analyses to look for signs of declining resilience (i.e. 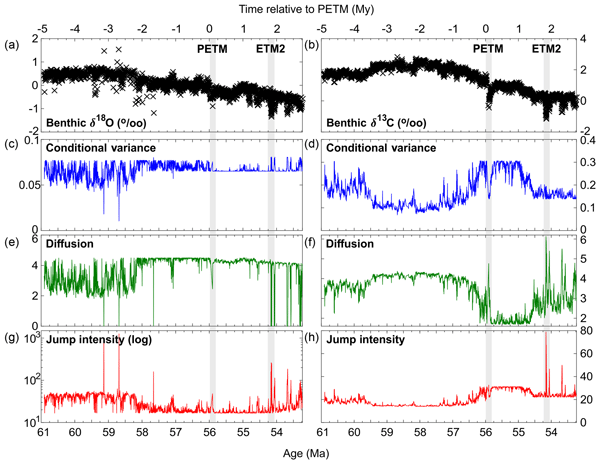 greater sensitivity to small shocks) in the global carbon cycle and climate system across the Palaeocene–Eocene Thermal Maximum (PETM), a global warming event 56 Myr ago driven by rapid carbon release. 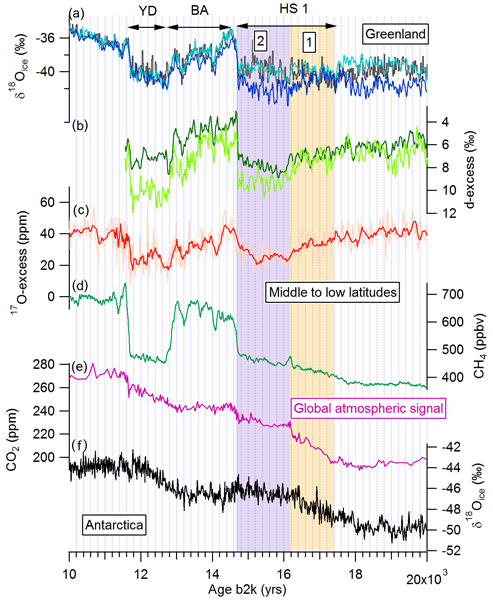 Our main finding is that carbon cycle resilience declined in the 1.5 Myr beforehand (a time of significant volcanic emissions), which is consistent with but not proof of a carbon release tipping point at the PETM.